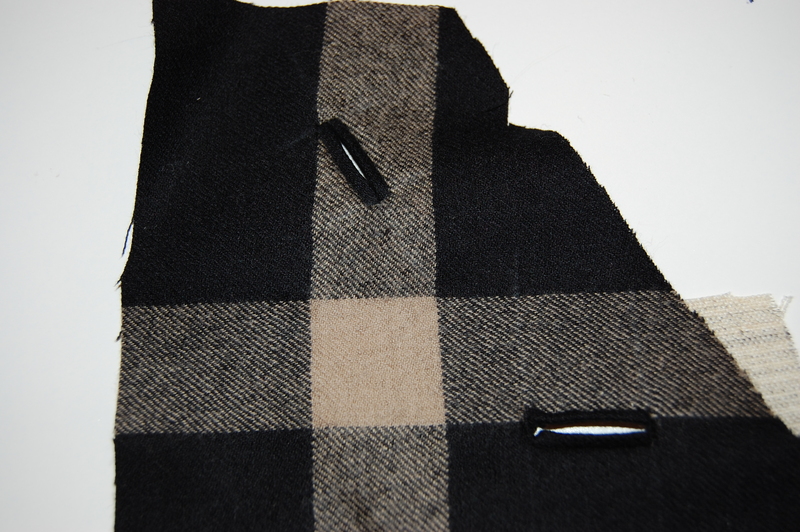 One day this week I sewed the final stitches on my wool suit. Yes, doing the skirt hem finished it off, and now it is ready to wear. For those of you who read my last post and ventured a guess on which pattern I used, you were correct if you chose number three. As a reminder, here it is. I made a few small alternations to this pattern, including shortening the skirt to just below the knee. 1) With such a bold plaid fabric, I thought a shorter jacket would be a better look. 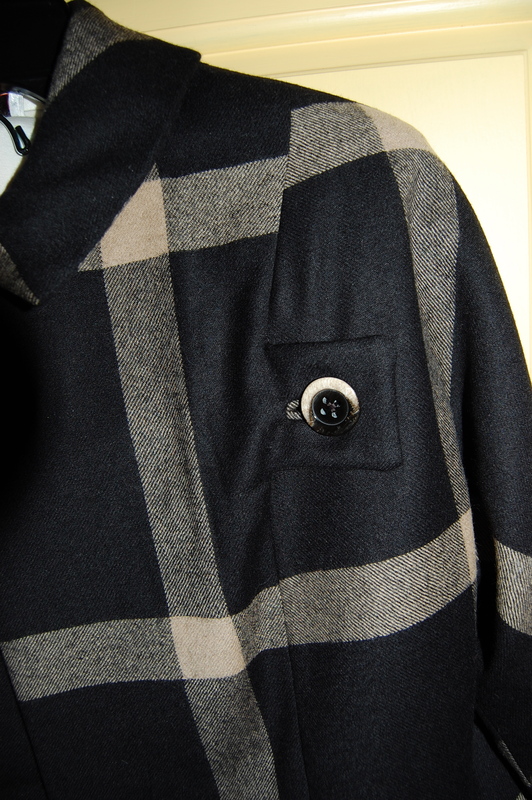 2) I thought the square tabs on the front of the jacket would compliment the windowpane check. 3) The kimono sleeves are such a classic mid-century look that I couldn’t resist trying them. 4) And, I love a challenge! 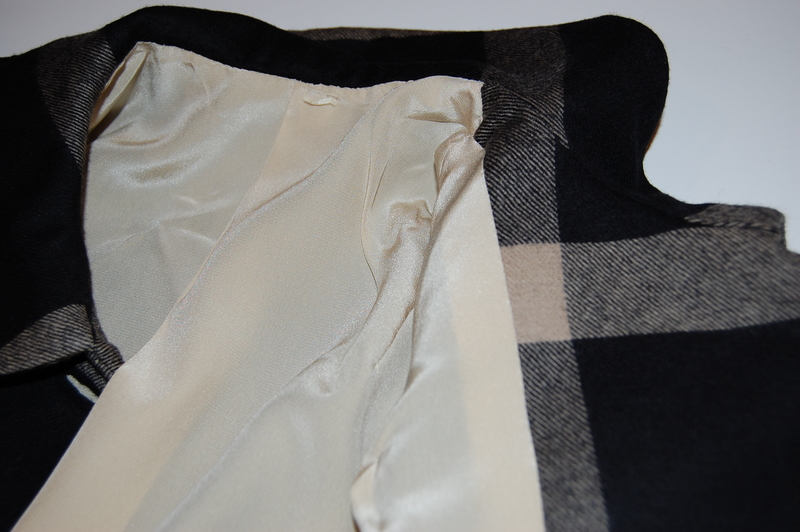 Even though the sleeves are “kimono” type sleeves, which means while there is no sleeve cap to match plaids, they do have seams down the middle of them cut on an angle. 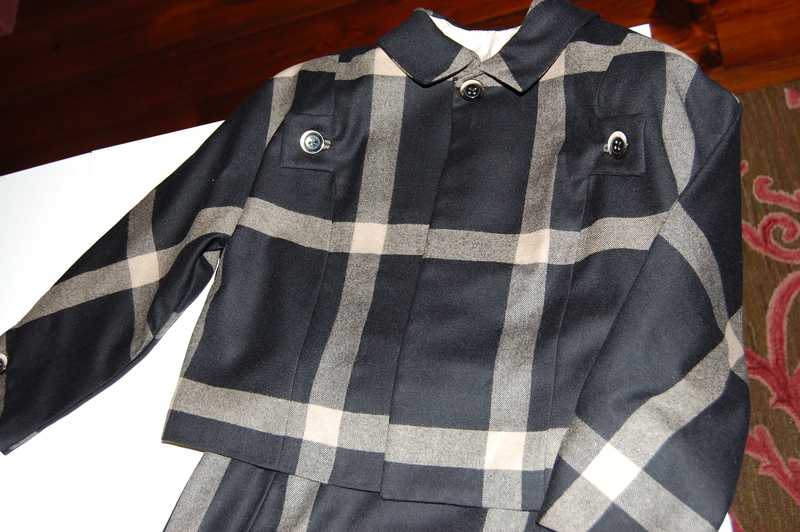 Plus the jacket has side, front and underarm seams, a rounded collar which puts the plaid on a curve, and, finally, the skirt has six seams. 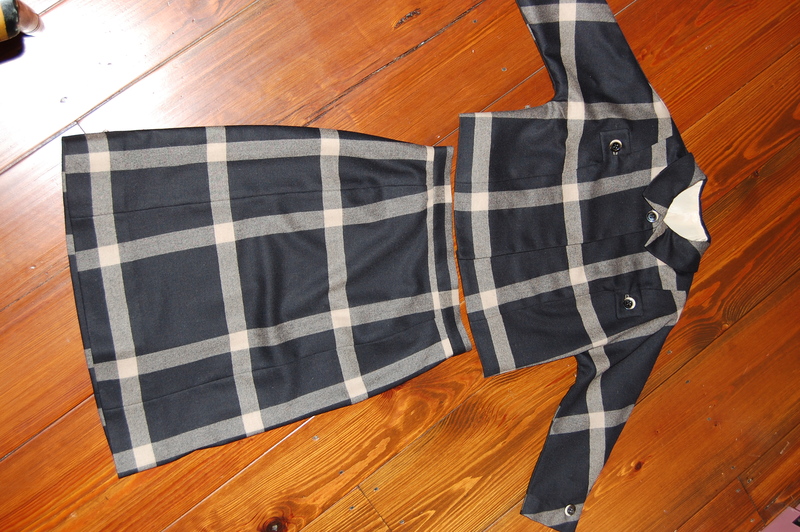 And, I needed to make sure that the check also matched, up and down and side to side, from jacket to skirt. So, that’s a lot of matching. The first thing I did was make up the jacket in muslin. From that I determined that I needed to add a couple inches to its length, and I decided to make the sleeves ¾ rather than below elbow length. Then I got nervous about the windowpane check looking good in kimono sleeves, so I got out my magic marker and “drew” the check onto the muslin, so I could visualize it. Okay, I liked it! 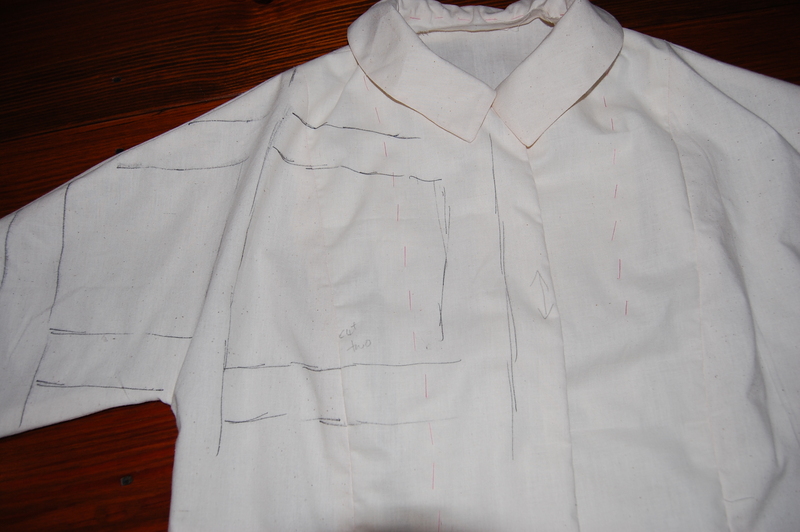 Here is my muslin - can you see the magic marker lines I drew on it? I sew my muslins using up bobbin thread that's left over from other projects - and I always baste in leftover contrasting thread. Then I laid out the pattern pieces, and oh my gosh, what a puzzle of matching notches and checks. I knew I couldn’t make a mistake, so after I laid it out, I let it sit overnight. The next day, after cogitating on it overnight, I realized I had not properly matched up the check on the shoulder seams. 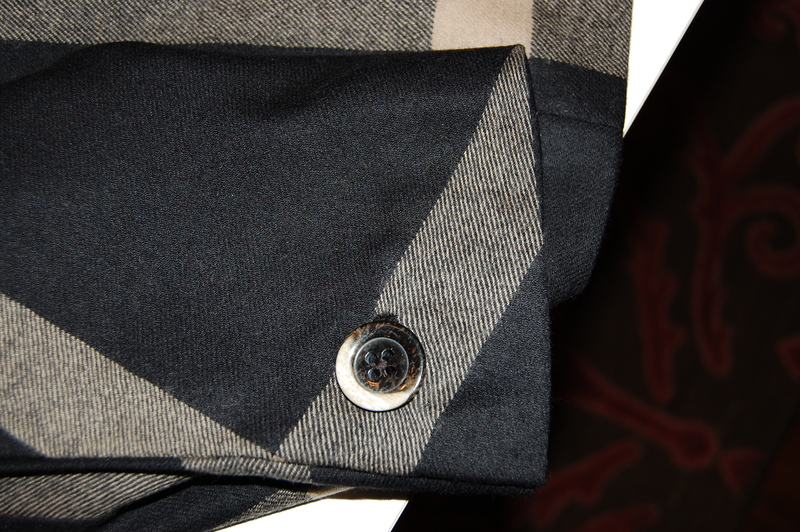 I made the adjustment, double and triple checked (pardon the pun), made sure I would have the same reveal at the hem of the jacket as on the skirt, and confidently (actually about 92% confidently) cut it – and the lining – out. First, I made the skirt (except for the hem). I like to put my zippers in by hand, as I just think it makes a nicer look. Here is the zipper, set in using small back stitches. 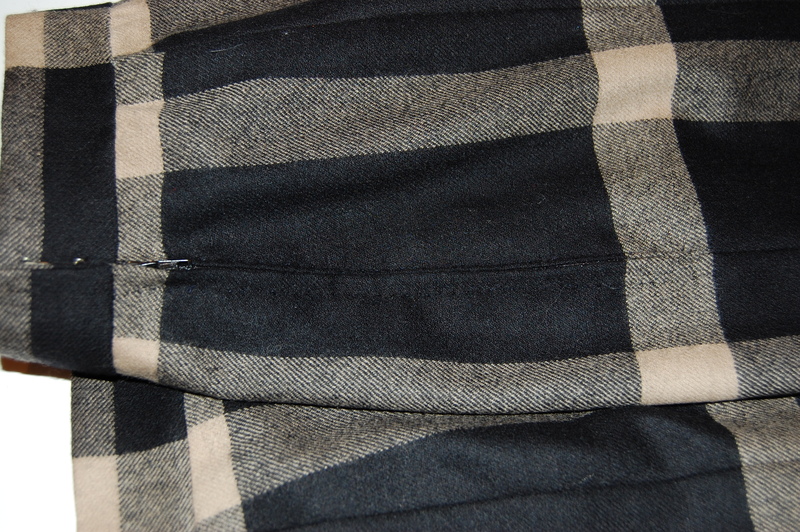 I bind the raw edge with a soft seam tape and then catch-stitch underneath to the waistband seam. This makes a nice, unbulky finish. By the way, have you noticed how it is now almost impossible to find a ready-made skirt or pants with a waistband? Another reason to sew! The jacket called for five bound buttonholes: one at the neck, on the two tabs on the front of the jacket, and in the sleeve plackets. (This, of course, meant that I had to find buttons first. A trip to the local fabric/craft store produced some, which I immediately recognized as “perfect.” They are made by La Mode, an old button company still going strong after 125 years.) Whenever I am making bound buttonholes, I like to make a couple of “practice” ones. Every fabric handles differently, and with this fabric, I also needed to decide what part of the fabric I would use for the “bands”. Here is my practice piece, which will help to explain what I mean. Here were two of the three "trial" buttonholes I made. I decided to use all black bands where the buttonhole would be on a light part and light bands on all black. These trial runs helped me make my decision. It always strikes me as being “out of sequence” when practically the first thing I have to do is make the buttonholes, but so it is with these bound beauties! 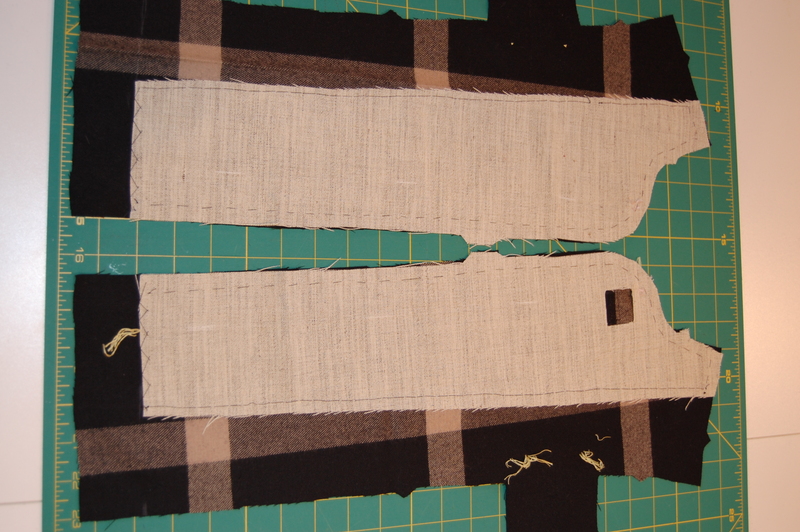 Of course, before the buttonholes comes the interfacing. 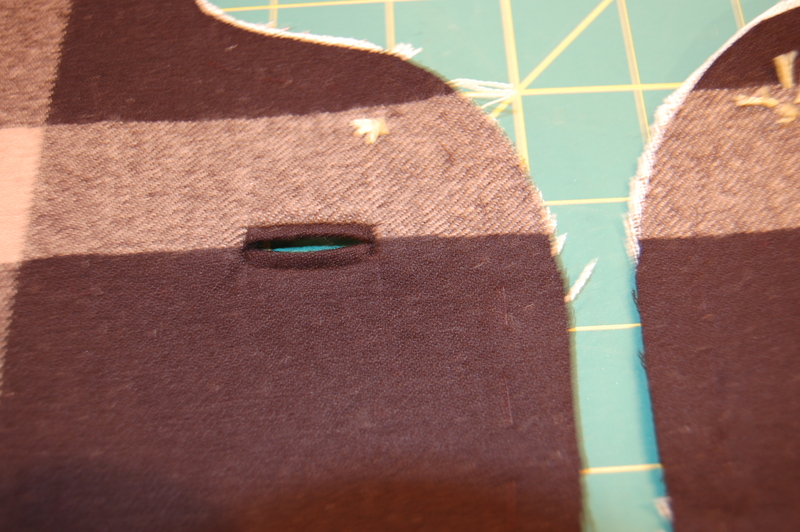 I cut a small square out of the interfacing on the right side in order to accommodate the bound buttonhole. 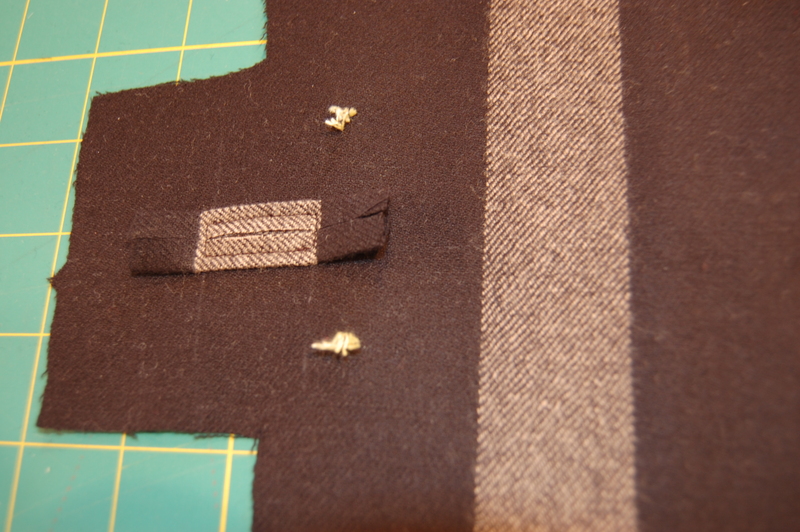 Here is the start of the buttonhole on one of the "tabs". The yellow fuzzies are tailor tacks. Here is the buttonhole at the neckline. 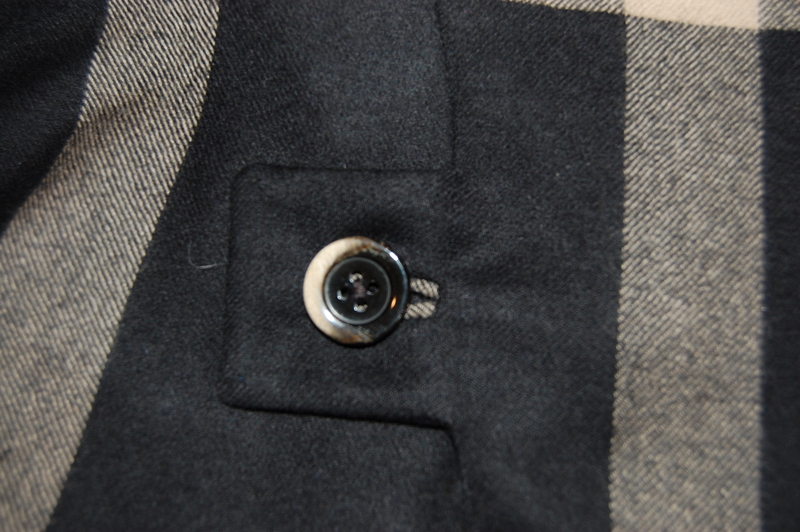 Here is the finished buttonhole on one of the tabs, sporting buttons which I think are perfect for this suit and fabric. And here is one of the sleeve plackets, all finished! The rest of sewing the jacket was fairly straightforward, just time-consuming! The collar was a dream to do because there was a separate pattern piece for the two-piece, bias undercollar. A bias undercollar makes the top part of the collar finish up with a smooth and neat turn. 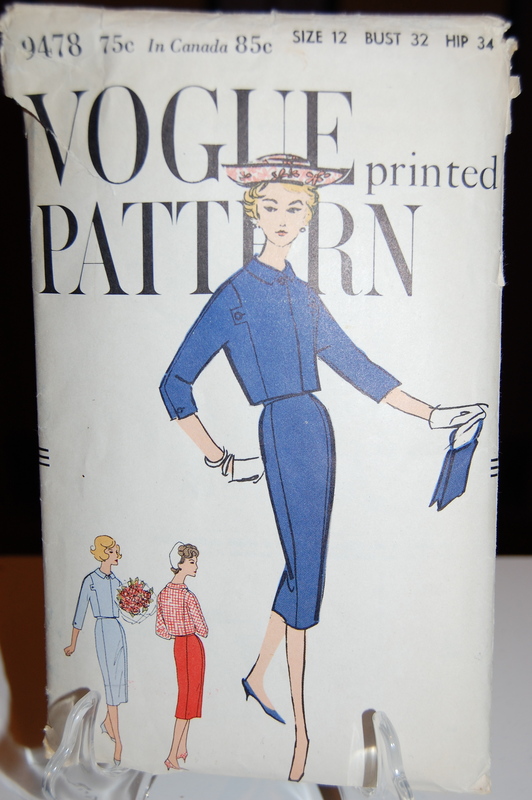 Vogue Patterns – I love you! I lined both the skirt and the jacket in a silk crepe de chine which I ordered online from fabrics.net/The Fabrics Network. This company, in Spokane, Washington, carries beautiful solid silks and other fabrics. I got swatch/color cards from them last year and have purchased several pieces of fabric from them, all of them lovely, excellent quality goods, quickly delivered. My suit, laid out on my sewing room floor - definitely prostrate from being worked on for so long! Here is a close-up of the jacket. Here is an example of the puzzle of matching the check up and down and side to side. 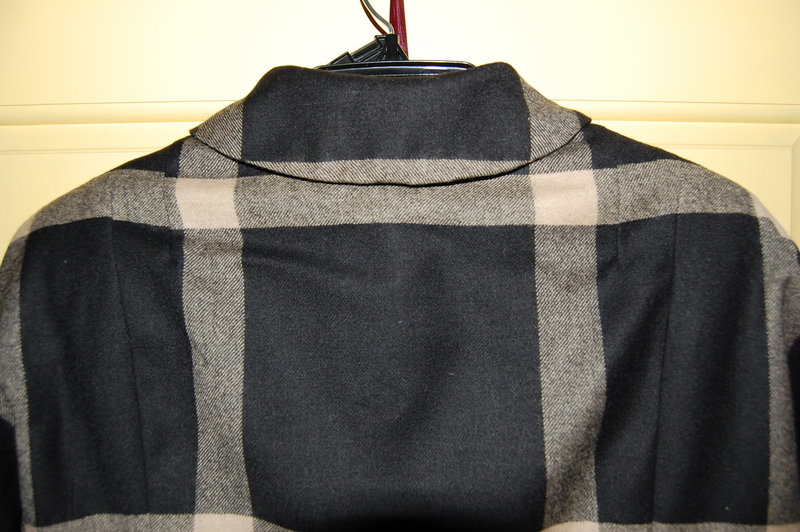 When I am wearing the jacket, I want the collar to match up to the back of the jacket. I think I was fairly successful with my calculations! 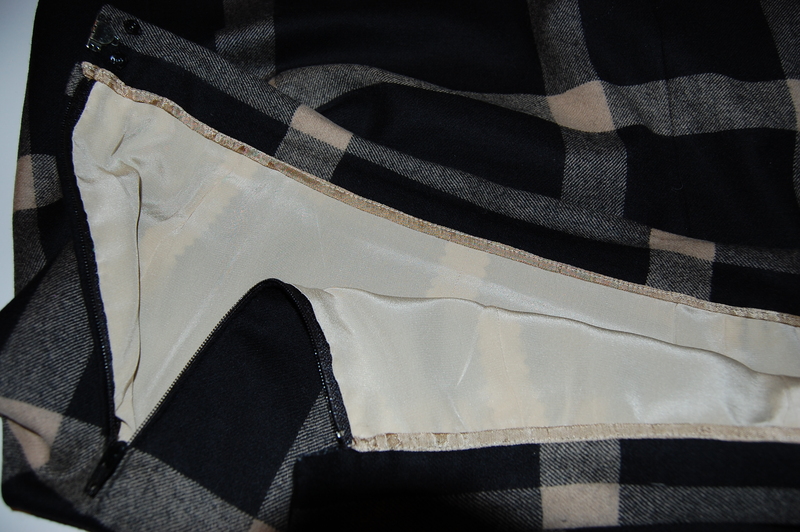 Finally here is a view of inside the neck, showing the lining and just a bit of the collar. Also, when I purchased the wool, I bought plenty to allow for matching those checks, and the wonderful salesperson at Britex cut the piece generously for me as well – many thanks, dear lady! 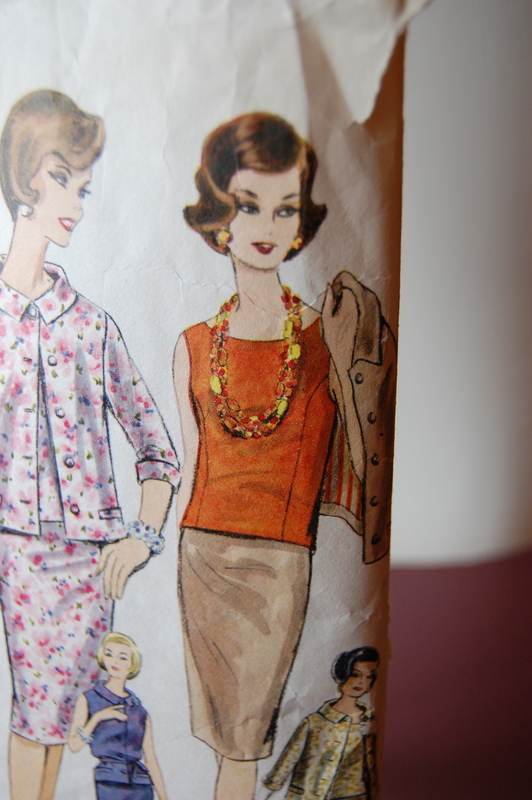 So – I have enough left to make a simple lined overblouse, which could be worn just with the skirt for a variation on a two-piece “little black dress.” Memo to self: move this idea to the top of my “sewing to do” list for next Fall! I always make myself crazy with matching everything – plaids, prints, and even polka dots. I made myself a sundress with a cute hollywood print all over it and (unfortuately!) I noticed that the pattern wasn’t completely random just before I cut it. So I had to match it – making the project harder than it needed to be. One of my tricks for matching (or at least lining up) a print is to make copies of the fabric on my printer. Then I trace my pattern pieces (without seam allowance) onto the copied print paper and then line that up when I cut it out of the actual fabric. That’s a great tip, Brooke. Thank you! As far as matching “everything” – I agree it can make you crazy, but it just looks better. I am amazed when I see expensive “ready-made” clothes where the plaids/prints are not well-matched. To me, it’s just basic to contemporary good sewing. I find matching so infuriating but obviously so worth it. Your suit looks amazing, I’ll look forward to seeing the blouse.